Independent republicans on Derry City and Strabane District council have declined to condemn a car bomb attack on Saturday. There has been widespread condemnation of the attack from politicians in each of Northern Ireland’s largest political parties – the DUP, UUP, Alliance, the SDLP and Sinn Fein. But the independent republican councillor Gary Donnelly, speaking to the News Letter, described “selective condemnation from politicians” as “nauseating”. Another independent republican councillor, Paul Gallagher, said the car bomb attacks “should be left in the past” but said he “deliberately” declined to offer condemnation. Five people arrested in connection with the attack, which has been linked by police to the grouping known as the ‘New IRA’, remained in custody on Monday evening. 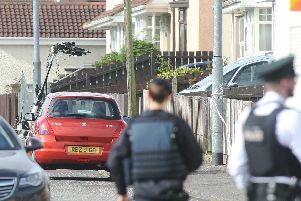 There was a second explosion in the city on Monday afternoon following two security alerts in the Creggan area – but this time it was a controlled blast carried out by Army technical officers on a van that had been hijacked earlier. He continued: “Some of the people who are shouting loudest about this are the very same people who (in the past) devised the car bomb and deployed it. They haven’t had a sudden Damascene conversion. Sinn Fein have been asked to respond to Mr Donnelly’s comments. Another independent councillor, Paul Gallagher, was also invited to condemn the car bomb attack. The DUP, meanwhile, said they will meet with the PSNI at 9am on Tuesday to discuss the threat posed by dissident republican terrorism.